A considerable proportion of students in Germany has graduated from vocational training before entering higher education. With this paper we examined how these students progress through higher education. We argue that successful graduation is the result of a sequence of decisions and decompose the trajectories through higher education to distinguish non-completion, transfer and dropout. We used the German Educational Panel Study (NEPS-SC6), a retrospective life course study, and applied logistic regression models. Our results suggest that students with vocational qualifications are slightly more likely to graduate from the initially chosen program than traditional students, but this advantage diminishes after controlling individual and institutional characteristics. After non-completion of the initially chosen program, the traditional students are more likely to remain in higher education and transfer to another program, whereas students with vocational certificates rather choose to leave higher education. Taking the entire trajectory together, our bivariate analyses reveal a slightly higher risk of leaving higher education without graduation among the students with pre-tertiary vocational training. Again, this association disappears in models that control for individual and institutional characteristics. 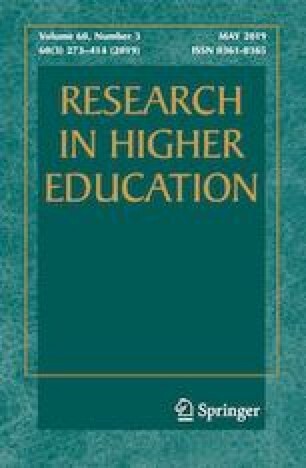 This paper uses data from the National Educational Panel Study (NEPS): Starting Cohort 6—Adults (Adult Education and Lifelong Learning), https://doi.org/10.5157/neps:sc6:7.0.0. The NEPS data collection is part of the Framework Programme for the Promotion of Empirical Educational Research, funded by the German Federal Ministry of Education and Research and supported by the Federal States. The work on this paper has been generously funded by the German Science Foundation within the Priority Programme 1646 “Education as a lifelong process”. The funding was provided by Deutsche Forschungsgemeinschaft (German Science Foundation, Grant No. TI 766/1-1). Crawford, C., & Cribb, J. (2012). Gap year takers: Uptake, trends and long term outcomes. UK Research Report (DFE-RR252). Department of Education. Institute for Fiscal Studies through the Centre for Analysis of Youth Transitions (CAYT). Retrieved from http://www.ifs.org.uk/publications/6472.